Imagine sitting at a movie theater watching the latest blockbuster movie about space. Because of its vast size, a galaxy pulls in smaller and slower-moving galaxies, trapping them in its orbit. Eventually this larger galaxy begins stripping away bits of mass from the smaller galaxies and, eventually, its own stars. You find yourself sitting at the edge of your seat, awaiting what happens. As exciting as this phenomenon seems, it’s not science fiction, but reality. What’s more, it’s not just any galaxy—it’s our very own Milky Way. Galaxies are born in dark matter, a mysterious substance that comprises about 90% of our universe. The Milky Way is a central galaxy, meaning it has smaller galaxies, called satellites, caught in its gravitational pull. Our galaxy has long been studied to increase our understanding of the universe. Specifically, researchers have based their predictions about dark matter and the formation of galaxies based on their observations of the Milky Way’s satellite population. However, researchers have discovered that the Milky Way might be an outlier. Marla Geha, professor of astronomy at Yale University, is a leader in this area of research—no other research group has tried to do a project as ambitious as hers, requiring extensive time and resources. By studying 8 galaxies similar to the Milky Way, Geha’s team have provided researchers with incredible new insight—the Milky Way Galaxy may be more unique than we think. 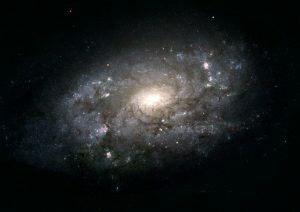 It is believed that galaxies form in the center of dark matter structures. Galaxies emit light from their stars—the more stars, the brighter the galaxy. Within the Milky Way, two satellite galaxies, called the Small and Large Magellanic Clouds, are currently forming stars from gas. All other satellites have been stripped of their gas as the Milky Way eats away at the materials composing the satellites, a process that occurs when smaller galaxies orbit the Milky Way. Researchers have heavily based their predictions about how galaxies form based off their research on the Milky Way’s satellite galaxies. However, Marla Geha, along with Risa Wechsler, professor at Stanford University, are interested in how the Milky Way compares to other galaxies in our universe. “We have a default assumption that whatever is in our neighborhood is what we see everywhere but maybe this isn’t the case,” Weschler said. The behavior we see in our own galaxy may not be typical of many other galaxies in the universe. 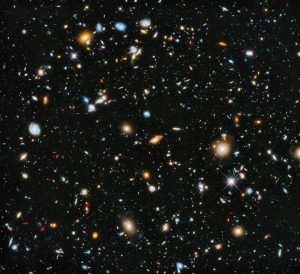 Using optical telescopes, more than 10,000 distant galaxies can be seen. Photo courtesy of Wikimedia Commons. Geha and Weschler, along with their research team, were interested in exploring other satellite galaxies beyond the Milky Way. To investigate these other galaxies, they started the “Satellites Around Galactic Analogs” (SAGA) Survey. The purpose of this survey is to investigate 100 galaxies similar to the Milky Way galaxy and to compare their satellite galaxies. Successfully doing so has implications on how researchers view galaxies. For example, satellite galaxies are of interest because it may provide clues about dark matter and its interaction with galaxies. When satellite galaxies become caught in the gravitational pull of larger galaxies, it is likely dark matter is at play, though it remains unknown how the satellite becomes embedded in what is essentially a halo of dark matter. Moreover, the behavior of these satellites, such as their ability to form stars, provides clues about the relationship between dark matter and satellites, and why some satellites have lost the ability to actively form new stars. To begin their research on both analog galaxies and their satellites, the team used already established catalogs to select galaxies similar to the Milky Way. The researchers based their criteria on how similar these galaxies were in luminosity as well as whether they had a similar large-scale environment. Galaxies that passed these criteria were added to the SAGA Survey for further analysis of their satellite galaxies. Of all the galaxies in the catalog, the team has so far added 79 galaxies to the SAGA and have fully investigated satellites on eight of these analogs. The next step is examining these galaxies more closely and searching for embedded satellites caught in the gravitational pull of these galaxies which may provide clues of similarities shared with the Milky Way. Researchers detect satellite galaxies through their brightness, an indicator of the number of stars within it. Images of galaxies are readily available in published research catalogs. The research team used a method called photometry, a procedure to detect light intensity from these galaxy images. However, photometry poses a problem—there is no way to tell whether this galaxy is circling another galaxy. “It’s like holding a series of galaxy images up of and trying to decide which is a satellite—you just can’t know,” Geha said. If researchers could find a way to measure the distances between these galaxies, they may be able to uncover the behavior of these galaxies. One method the research team used in uncovering this data was to analyze the spectra of the galaxies. By scattering the light emitted by the galaxy, they were able to observe the characteristic wavelengths of the light energy emitted. Similar to scattering white light with a prism to release its rainbow colors, Geha and the team took images of galaxies and separated the light into many different wavelengths, or colors. Objects moving away from the Milky Way emit less intense light and subsequently undergo a shift in wavelength toward the red end of the color spectra where wavelengths are longer. Therefore, a galaxy with a larger redshift is moving further away. By gathering this information, the researchers were better able to understand the position of potential satellite galaxies, filling in the missing gap in knowledge about whether these galaxies are indeed satellites of a central galaxy. However, using this process to obtain redshifts comes with its own set of difficulties. For example, spectroscopy is expensive and time consuming. In addition, the slower that a galaxy moves, the fainter and harder it becomes to detect the redshifts. Though the research team was able to target over 17,000 redshifts, the spectra obtained may be not only from galaxies themselves, but also from stars and other objects. Therefore, they needed to further filter out the redshifts corresponding to galaxies from those caused by other natural phenomena. To create a more efficient system for detecting redshifts of galaxies, the researchers observed the relative wavelengths of satellite galaxies and their redshift range. They found a range in which the redshifts were similar among satellites, indicating that redshifts in this range were the most likely to correspond to satellite galaxies. By going back over their collected sample of redshifts and selecting redshifts that fell within the “satellite galaxy” range, they were able to leave out redshift data from unwanted sources. Using this refined redshift information, researchers were able to locate 25 satellites from analog galaxies, providing us a new perspective on the nature of many potential satellite galaxies in the universe. The Milky Way Galaxy—an outlier? The Milky Way Galaxy has long been studied, and houses numerous satellite galaxies. Photo courtesy of Nasa. The process of obtaining redshift information to determine satellite galaxies is a slow process, but it comes with a great payoff. The team’s analyses of these satellite galaxies have revealed an interesting finding: the analog galaxies contain mostly star forming satellite galaxies. Unlike the Milky Way, the results from the 8 analog galaxies indicated 26 of the 27 satellite galaxies are actively forming stars. “If more information supports this finding, we need to start reevaluating how we view our own satellite galaxies in the Milky Way,” Wechsler said. While the study has surprised the research team, there still remains much to uncover, and they are just getting started. The team is leading in this field—there is no other research team doing such an ambitious project. Once the SAGA is completed, scientists will better understand the Milky Way from a cosmological standpoint and how it compares to other analogs. “We’re really proud of the progress we made and we are well underway in answering the question of how atypical our galaxy may be,” Geha said. With a goal of analyzing 100 analog galaxies similar to the Milky Way, the researchers are already analyzing the data of other analogs for their satellites. With more efficient methods for detecting redshifts, the team can more effectively locate even the faintest satellites. While Geha is not certain what the rest of their data will indicate once they finish analyzing all satellite galaxies, she believes it might take as few as two to four years to finish the survey and make more conclusions. “Once the SAGA Survey is complete, I think we will really understand our galaxy in a much broader context,” Geha said. Until then, the SAGA continues in uncovering the mystery of our galaxy. Jessica Trinh is a sophomore Neuroscience major in Branford College. She is the Vice President of Synapse and is excited to teach middle schoolers about STEM. She also teaches health education in New Haven middle schools, nutrition counseling at HAVEN Free Clinic, and is currently leading a research project on nutrition. The author would like to thank Dr. Marla Geha and Dr. Risa Wechsler for their time and enthusiasm for sharing their research. Geha, M., Wechsler, R.H., Mao, Y.Y., et al. 2017. “The SAGA Survey I: Satellite Galaxy Populations Around Eight Milky Way Analogs. The Astrophysical Journal 847, 1-21. Bland-Hawthorn J. and Gerhard O. 2016. The Galaxy in Context: Structural, Kinematic, and Integrated Properties. ARA&A 54, 529-596.